Decorating With White — Finn Trading Co. The all white room is having a serious comeback. When we think of a color washed space, we tend to come up with adjectives like "sterile" or "cold". While the idea of a such blank canvas can be daunting, the simplistic nature of a single color palette can be soothing & dynamic. By using different shades of the color white & by choosing different textures in your pieces, you can create a space that feels vibrant.... even if it's all done in the same color. There are so many options when choosing the right "white". By picking a warmer white, and sticking to similar hues, darker rooms feel light, bright & airy. Cooler whites are better from naturally lighter rooms. 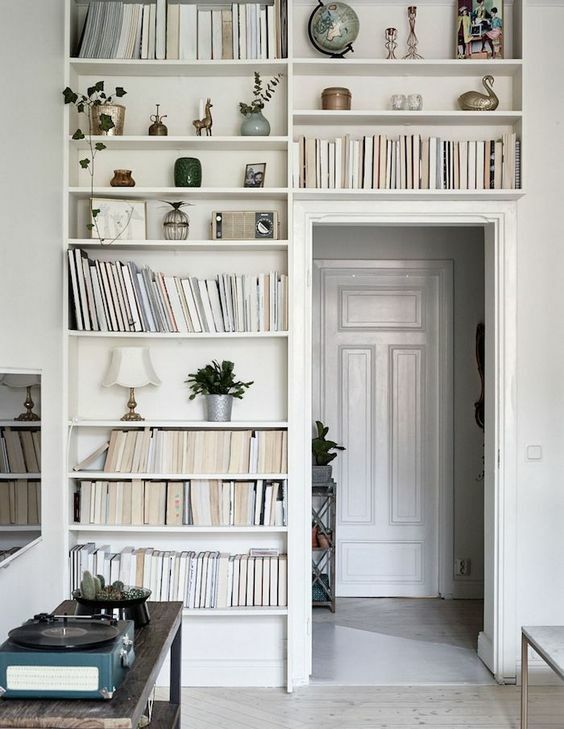 Avoid the bookcase clutter by painting everything white and flipping all the books around. Not only does your space look clean but the oddities, no matter how small, really pop. Keep monotone spaces interesting by adding items with different textures. Think about using different fabrics with varying weaves to create a cozy habitat. Add in some greenery for a little extra depth.